We’ve previously covered Nosey Parker and its brief spat with the official AA carpark finder app. Now UK iPhone users have another way to find a car parking space with the launch of iParkMyCar. 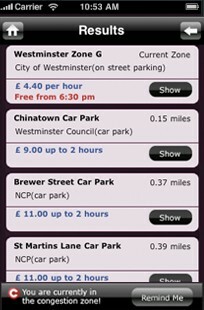 Unlike other apps’ nationwide approach, iParkMyCar [iTunes link] focuses on London. This city-specific focus has allowed more detail to be included than simply the nearest carpark. iParkMyCar also includes pay and display residential parking zones which can also have a pay and display option. 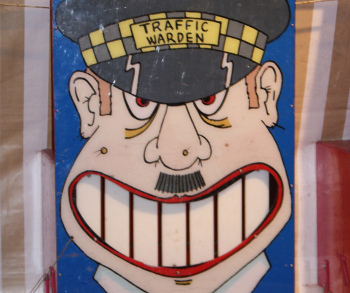 If a traffic warden patrols an area, the app will indicate when the parking wardens clock off so that you can take advantage of the free parking on offer. The app’s author, Chris Bocsardy, says that the data for the app was created using “Extremely time consuming personal research”. This may have resulted in more data than relying on a readily available dataset may would have but there’s a very real risk of some of the data going out of date quite quickly. The app also throws in a “Where did I park my car?” location tagging feature and car parking timer for pay and display carparks. These are far from original, but useful additions nevertheless. Being neither a driver (public transport FTW!) or based in London, I was unable to test out the app. Its functional graphic design won’t win any awards, but if you’re in the market for a London parking assistant app iParkMyCar’s “insider knowledge” may well give it the edge over its rivals. Let’s just hope that Bocsardy can keep the information in the app up to date. Read next: Oh dear...AT&T puts an end to its unlimited iPhone data pricing plan.